Canine Academy - obedience, boot camp & more! Canine Academy is WNY's premier dog training facility. Conveniently located on Main street in Clarence, NY. We offer dog training tailored to you, and your dog's individual needs. We can't wait to help you get started on your way to problem solving your dog problems and building a better relationship with your four legged friend. Are you tired of being dragged around the block on walks? How about coming home to things chewed up and destroyed? Are you worried that your dog will jump up on company when they come over? We have solutions! We're here for all your problem solving, and dog training needs. 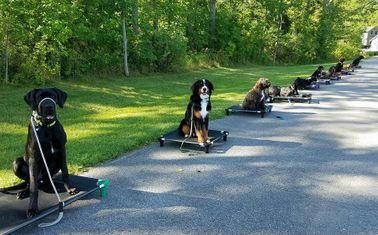 Our convenient evening and weekend classes, and the flexibility of private lessons ensure that no one has to deal with an untrained dog. With over 20 years in business and more than 50 years of combined experience our reputation speaks for itself! Our goal is to continue to be one of WNY's premier training facilities in the area. We are passionate about what we do, and we are proud of the results we get! We look forward to meeting you and your “best friend”.